KAF thanked SAK who provided his house for the meeting and arranged a very delicious lunch for all the attendees. KAF highlighted the activities occurred during the month of September 2014. KAF signed a reminder letter addressed to Saudi Aramco asking their assistance in running SAEEA activities smoothly. During SAEEA 11th Reunion, a leading newspaper announced certain giveaways items for the children attended the picnic. Furthermore, the newspaper announced good number of giveaways items for ladies, gents and children during the forthcoming SAEEA’s 12th Reunion. SAEEA will distribute children items during the forthcoming 12th reunion. SAEEA will also distribute other give away items thru LUCKY DRAW during the 12th reunion. SAEEA’s Ladies Representative, Mrs. Younus Shaikh is planning to settle down in the United States. GQK contacted Mrs. Qamar Khan seeking her intention for working in place of Mrs. Shaikh. She agreed to perform the duties of Ladies Representative and will meet SAEEA Representatives upon her return from the United States. KAF with the agreement of other Attendees approved SAEEA Identification Cards for PAID MEMBERS only. SAK will work on this project and the IDs will be distributed among all during the forthcoming 12th Reunion. SAEEA will shoulder the expenses of the Cards. SAEEA noticed that certain SAEEA Members have been taking less interest in SAEEA activities. To rebuild their interest, SAEEA decided conveying SAEEA message with current activities thru CDs. The same CDs will be distributed to PAID SAEEA Members. SAEEA Office Bearers will personally visit to reachable Members and deliver the CDs at their residences. SAEEA will shoulder cost of the CDs. 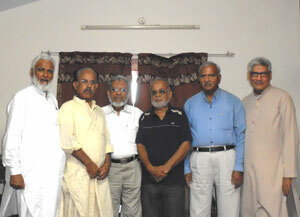 SAEEA 12th reunion will tentatively be held during the month of November/December. KAF requested all Office Bearers to visit certain Restaurants and provide their feedback during the next SAEEA meeting. GQK will contact those Members who had confirmed their attendance for 11th reunion; however, could not attend because of their own reasons. SAEEA always makes arrangements for confirmed persons only and bear the losses if the confirmed person could not attend the event. MSH updated the attendees about SAEEA account and paid members. SAK with the assistance of other SAEEA Office bearers surveyed the market to have SAEEA’s own personal sound system. KAF approved one of the best systems and requested MAM and SAK to purchase the system. MAM presented updated inventory for SAEEA wall clocks and valets. KAF prayed for fast recovery of all sick people, especially for MSH’s mother, Iftikhar Ahmed, Anwar Mirza and Mohammad Ashraf. Two relatives of SAEEA Members passed away (1) Engr. Iqbal Ahmed Khan’s Sister-in-Law; and (2) Ovais Akram Ali’s Brother.